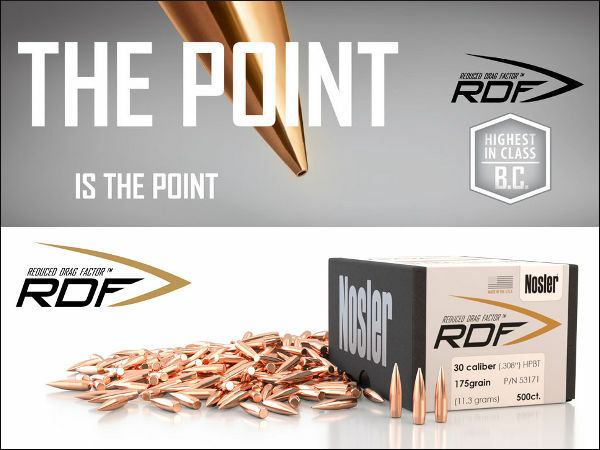 Nosler has introduced a new line of RDF™ (Reduced Drag Factor) bullets that feature very high BCs, hybrid-type ogives, and tight, factory-closed meplats. Based on initial specs, Nosler’s new RDF bullets should be very competitive match projectiles for their respective bullet weights. Nosler claims its new RDF bullets have “the highest BCs and smallest, most consistent meplats of any hollow-point match bullet line on the market.” RDF projectiles will be initially offered in four calibers: .224, 6mm (.243), 6.5 mm (.264), and .308. 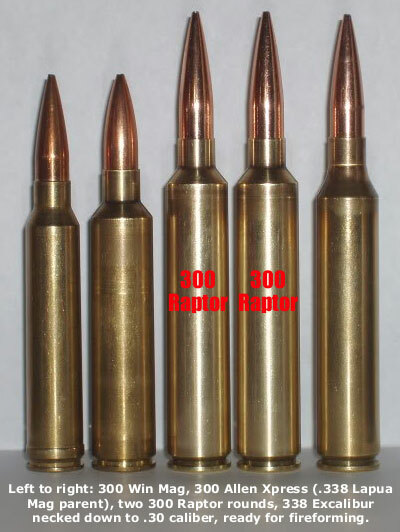 Nosler designed RDF bullets to have very high BCs for flatter trajectories and reduced wind drift. Nosler achieved high BCs by adopting a modern hybrid-type compound ogive, which bridges traditional tangent and secant bullet shapes. Another benefit of the compound (hybrid-type) ogive, is that this shape is normally less sensitive to bullet seating depth than a pure VLD-style, secant ogive shape. That allows hand-loaders to seat off the lands and still get excellent accuracy, which can be maintained even as the throat moves out over time. RDF bullets also feature a long boat-tail for aerodynamic efficiency. Compared to conventional match bullets, Nosler’s RDF bullets look quite different because the tips have been tightly closed up at the factory. Nosler claims a a 40% average reduction in meplat size vs. conventional hollow-point bullets. With Nosler doing the work on the tips, hand-loaders no longer need to point and trim tips, a laborious task done to improve BC and, more importantly, to make BCs more consistent for every bullet in the box. Consistent BC translates to reduced vertical spread at long range. Share the post "Nosler Introduces High-BC, Closed-Meplat RDF Match Bullets"
Halloween is just ten days away. Talented trick-shot artist Kirsten Joy Weiss, did something special in prep for the gouls/goblins holiday, “carving” a pumpkin using her semi-auto Volquartsen .22 LR rifle. Kirsten had to send a lot of rimfire rounds into her orange friend. It turns out the little .22-caliber bullets worked better on exit than entry — Mr. Pumpkin’s posterior side was more impressive than his front. But overall, the effort turned out very well indeed, as you can see. Nice job, Kirsten. 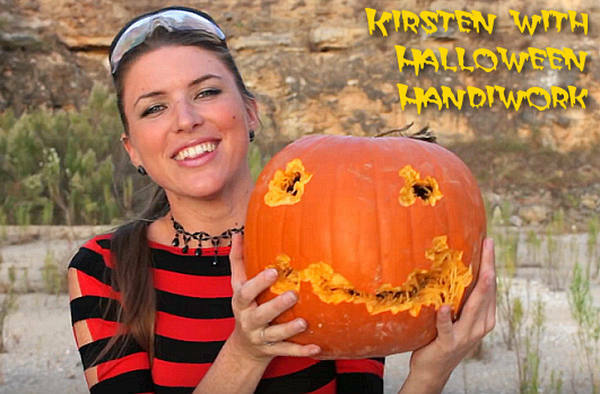 Share the post "Pumpkin Carvin’ with Kirsten — Halloween Artistry with .22 LR"